Back when we still lived in Poland the biggest treat for my sister and me were Kinder surprise eggs. 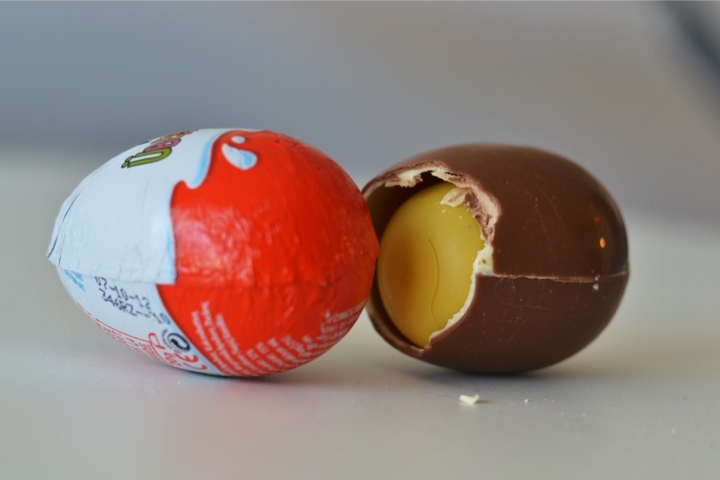 Nothing matched the excitement of biting into that delicious chocolate, except opening the plastic egg inside to discover your surprise. The nice lady at the little corner shop sometimes weighed the eggs for us so that we had a higher chance of getting the better toys. I remember having a whole collection of Teenage Mutant Ninja Turtles, Smurfs and a family of crocodiles. A few years after we moved to South Africa for some unknown reason they discontinued the traditional eggs and introduced a rather mediocre alternative with two different halves where you have two chocolatey balls and you dip them into white chocolate. The whole thing is eaten with a spoon and the toys are pretty much as cool as the spoon (I.e. not very). So you can imagine my absolute delight when I went grocery shopping in Zug at the Coop and spotted something that looked like traditional Kinder eggs. My suspicions were correct and I even got a Papa Smurf! I had same disappointment experiencing new age kinder age :(. Nothing like old school one :). Thnx for reminding me of this nice memory of my childhood. it is an absolute pleasure – they really were a treat when we were little weren’t they? Hehehe, I have to say though the taste didn’t do it too much for me but I think it is because these days I only eat dark chocolate so no milk chocolate ever tastes that good. If only they made a dark chocolate kinder (grown up) egg I would be in heaven. Nothing beats the original Kinder eggs. The new ones are horrible. Totally! They should be embarrassed about those. I can’t believe they are very popular?!?! Hahaha, swietnie! Daj znac co dostaniesz w prezetcie. Maybe next time I’m in Switzerland I can send you a a package over. 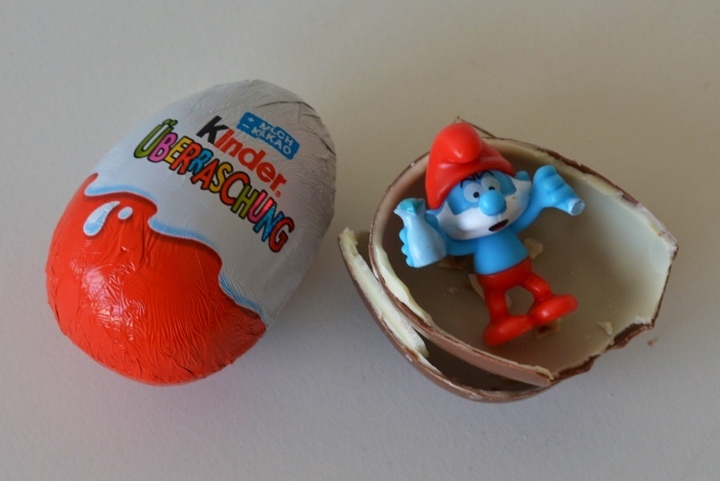 It is amazing how many people have such strong childhood memories of kinder eggs. I loooove Kinder eggs… but it’s been a while I haven’t one. Now i’m craving for it! hehe I’ve noticed that the surprise toys has been improving throughout the years. At my time, the toys were weird, like little monsters or a random baby toy with big nose! It’s always good to remember those moments we highly enjoyed when we were kids. Nice post! 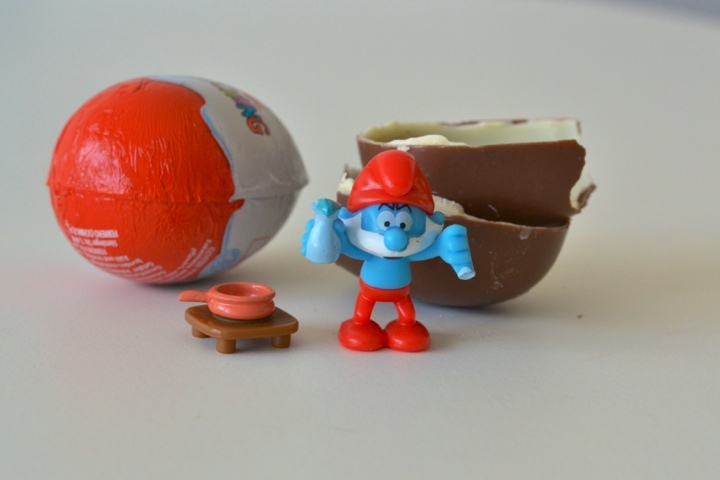 Thank you so much – I can’t believe through this post what an imprtant part of childhood kinder eggs were for so many – and how disappointing was it when you got a bad prize??? Totaly agree that the prozes today I pretty rubbish, I was very happy about my papa smurf.